It’s called “Ask Nevada County” – and when residents are asking about, or reporting, an issue, the app allows county staff to quickly respond. See a pothole when driving down a county road? Just click on the app and report its location. Come across an illegal dumping, just pull out your smartphone and drop a pin. For those who are not app savvy, the program is also available through the Nevada County website. Residents can also easily track their service requests in real time, as well as receive status updates and completion information. A request goes directly to the appropriate county department and staff will immediately receive a notification. While requests used to involve explaining the issue over the phone, in writing or in person, now a request is sent with just a few clicks on your smart phone or computer. “The idea is to improve customer service for county residents and to improve accountability,” says Nevada County Solid Waste Program Manager David Garcia, who is a strong advocate for the app. The number of county departments utilizing the app is expanding. Residents can make a request regarding a variety of issues, including road maintenance, environmental health, solid waste, wastewater, drainage, code compliance, building inspections and agricultural concerns. You see a pothole, illegal dumping or drainage issue, just let the county know through the app. The pindrop has helped county staff easily find a reported site. “It’s an invaluable tool. We have a lot of remote, hard-to-find locations” in the County, explains Garcia. The days of hearing that a problem is beyond the river and past the third large rock are over. The app’s ease of use is evident in the number of public requests that are being made; it was utilized by the public more than 800 times in 2018. And county staff expects that number to increase this year as more resident see its value. “Ask Nevada County” has assisted the county staff as well, increasing efficiency and response time. Customer service requests can now be easily coordinated in a manner that the most urgent ones are responded to first. And under the new system, about 90 percent of the requests are completed within seven days. That means there’s an overall increase in public safety. “It’s important for us to be prompt … and address the situation as soon as possible,” Garcia says. 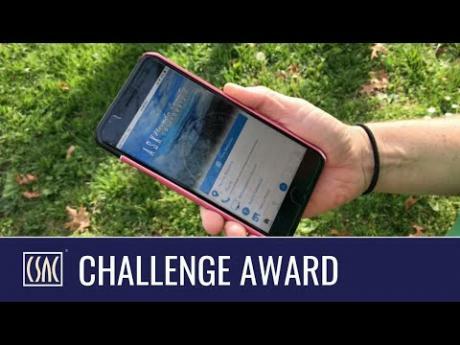 This Nevada County program is a recipient of a 2018 CSAC Challenge Award, which spotlights the most innovative programs in county government.